Whether you’re buying glasses for your child or looking into what you should get for your own next pair, there are two ways to go about choosing a new pair of glasses. There are the people who ‘just go with it’. They drift happily from the optometrist to the frames shop without too much worry. You peruse frames until you find something that looks okay in your price range, have the optician mark where the center of your vision is and wait for the call. Of course, this means you wind up with whatever frames were available at the time and standard 1.50 index plastic lenses. If you have an average to weak prescription and aren’t too worried about specific styles, this can be perfectly acceptable but there is also a large percentage of our large glasses-wearing population who want a little more control over the glasses they’ll be wearing for the next year or two. For most people, once you figure out the kind of frames that work best for your face and lifestyle, the real question is what you want done about the lenses, and there are dozens of choices. Standard plastic lenses are shatter-resistant but there is pretty much nothing else special about them. If you have a strong prescription, they will be thick and often stick out the sides of your frames. This is why so many people have decided to look into high index lenses instead, but which option is the best? Standard lenses are at an index of 1.50 while the highest options are between 1.74 and 1.90. The stronger your prescription, you can choose higher indexes allowing for incredibly thin lenses but for people within the average range of visual correction, your best bet will be between the 1.59 and 1.67 range. Which high index lens option you choose should be determined by a combination of your prescription, budget, and lifestyle. Low to mid ranges of high index tend to be sturdier and more friendly for sportswear while higher indexes can be more delicate and much thinner. Today we’ll be talking specifically about the range between 1.59 and 1.67, neither the lowest nor the highest of the high index lenses and therefore where most lens shoppers will find themselves. If you don’t have an extreme prescription but still want all the sleek, stylish, and visual advantages of high index lenses, you are likely to be choosing between polycarbonate lenses and the 1.67 high index plastic lenses. What is a Polycarbonate Lens? To make the right choice, it helps to understand exactly what you’re choosing from. We’ve been throwing around the term ‘polycarbonate’ but what does that actually mean? The origin of polycarbonate lenses comes from way back in the 70s when lens plastic wasn’t as nice as it is today. Old plastic lenses tended to yellow, and worse, to shatter on impact almost as badly as glass. As an effort to make wearing glasses safer, lens crafters were charged with the task of inventing a stronger, more shatter and scratch resistant plastic lens material that was both lighter and safer than glass. What they came up with was an incredibly dense plastic that was, in fact, the very first high index lens. This happened because the dense plastic, as it turns out, bends light more efficiently because the molecules are compressed closer together. While they only raised the index 0.9 points of an index from the original 1.50 to 1.59, the lenses were both sturdier and, amazingly, thinner. Needless to say, polycarbonate lenses were a hit. They have been a popular choice for both adults and children with glasses for the last 50 years and the formula has only improved since then. Since the invention of polycarbonate lenses and the discovery of high index lens materials, lens crafters and even other plastic manufacturing companies have begun experimenting with more and more compact and light-efficient plastic materials. Because these materials have no other use than as high-index lenses, they have become known as high-index plastics and come in a range from 1.60 (right above polycarbonate) to 1.74, the highest possible index for plastic glasses. In this range, 1.67 is by far the most popular of the high-index plastics because it represents a balance between cost, durability, and the prescriptions that can comfortably be accommodated by a high index lens. Who Should Wear Polycarbonate Lenses? Polycarbonate lenses have existed for a long time and in that time they have remained a competitive option compared to the procession of more modern materials. Why? Because somehow that first invention had an incredible amount to offer. The first and most important thing to remember about polycarbonate lenses is that they are incredibly sturdy. You can sit on them or drop them without a crack and, depending on arm strength, they might even be able to survive being thrown across the room, making them the ideal choice of parents for their young, active, and sometimes eyewear-rebellious children. Polycarbonate lenses are capable of surviving sports tumbles, fights over wearing glasses to school, and unexpected PE projectiles without coming home in a shattered mess. They are also a highly favored option for adults who live active lives or whose work environments are potentially hazardous. Construction, manufacturing, and other occupations that may involve flying particulate and projectiles value polycarbonate lenses highly for their durability, as do professional athletes, motorcycle riders, and camping enthusasts. Polycarbonate lenses are also useful for the older generation, though retirees are usually less likely to participate in dangerous jobs or active sports. This is because polycarbonate lenses block 100% of UV rays that would hit eyes through the glasses. UV rays are potentially harmful to eyes, can cause trouble seeing, and accelerate the development of cataracts in people over 40 years old. While it’s still a good idea to protect adult and child eyes from UV, it is especially important for anyone who has gone physically ‘over the hill’ and is at risk of increased health problems. Who Should Wear 1.67 High Index Lenses? Polycarbonate lenses get a lot of press because they’re great for several specific uses, but let’s not discount the value of sleek, slender, and clear 1.67′s. High index plastic tends to have a greater visual clarity and, of course, a thinner profile than polycarbonate which only has a 1.59 index. If you’re not a child and don’t have any special need for super sturdy lenses, you could have a lot more to gain by choosing the more advanced and office-friendly high index plastic for your next pair of glasses lenses. To start with, high index plastic tends to have much improved visual clarity meaning that there will be less distracting little reflections in your lenses, no blur out toward the edges of each lens, and people will be able to see your eyes more clearly from the outside as well. 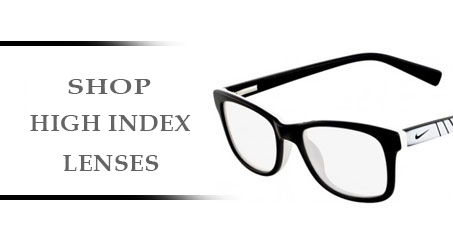 If what you really need is to see perfectly through stylishly lightweight glasses, then the 1.67 high index lenses are likely to be your best personal choice. Next is the advantage of having literally thinner lenses. They don’t seem thinner because of the visual clarity, these lenses are a full 30% thinner than normal lenses and about 10% thinner than polycarbonates. This means that stong prescription lenses can fit into thinner frames, look good in wire or half-frame styles, and you don’t have to look through nearly so much plastic to perceive the world with near-perfect visual clarity. Which Lens Material is Right for You? 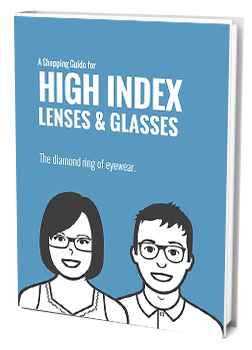 If the next pair of glasses you’re looking for will be your everyday office pair, meant to look stylish, understated, and accent your face like a finely rought piece of jewelry, then we highly recommend the 1.67 high index lenses. If, on the other hand, you’re buying for a child, senior, or if the pair will accompany the wearer to very active or hazardous activities, stick with the nearly indestructible polycarbonates. Happy lens shopping!